Deadly Sin Game Review - Download and Play Free Version! Eliminate the Seven Deadly Sins and Fulfill Lorelai's Destiny in Deadly Sin! Young Lorelai's life is sent spiraling when her mentor, Winchester, suddenly disappears, leaving only a note that Lorelai must begin a quest. As the story unravels, she learns that she is heir to a powerful empire! Join Lorelai on her journey around Dondoran through dark mausoleums, dangerous forests and shady cities as she meets interesting people like a handsome thief and a fiery priestess. Help Lorelai destroy the seven deadly sins! 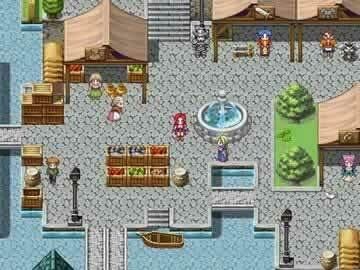 Enjoy classic role-playing game action as you guide Lorelai on her quest. Gather party members and control them all in battle. When fighting dangerous monsters in turn-based battles, you can choose the attack, skill or item that you want each character to use. Each of the six characters has a unique skill tree. Choose which skills to improve as each character levels up, such as putting skill points into Lorelai's burning arrows. Can you perfect the characters so that they can make it past wicked thieves, giant spiders and many more terrifying enemies to fulfill Lorelai's destiny? If you're ready for an adventure, then this game is for you! Enjoy a good story, amusing characters and exciting fantasy action for more than 30 hours of compelling gameplay. The beautiful music and thrill of playing this game are so memorable that you'll long to return to the incredible world of Deadly Sin for another fun time. Destiny is calling to Lorelai. Will you help her discover her future and destroy the seven deadly sins now? 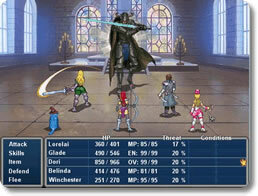 Deadly Sin is a classic role-playing-game that has a mid-90's look and feel, similar to Final Fantasy. It keeps all the classic dungeon searching, treasure hunting, and character management elements found within this genre and adds some slight variations that are quite refreshing and useful. For starters, as you level up your five character team you'll collect skill points which you can spend on each character's unique skill tree. This allows you to start specializing your members early on and to unlock higher tiers earlier with some careful planning on your part. Tied closely into your skills is the threat system which is employed in the turn-based battles. Enemies will focus on those team members which deal out the most damage, and so you can draw their attacks against your stronger melee warriors and use other character's healing abilities without drawing too much attention to your weaker spell casters. Consequently these aspects add in a rather deep strategic element to your RPG experience and keeps things interesting as you work through the story. The story is also another key element to Deadly Sin and it grabs on to you early and doesn't let go. Unlike other RPGs where you have to spend a good amount of time getting into the story and performing simple fetch quests, Deadly Sin will have you collecting companions and spending Skill points within the first half hour. You'll be exploring creepy mausoleums and giant capital cities in no time and the game does a good job of balancing combat with exploration. The battles are random in nature but there are special Monster Nodes which once found turn off the random battles within a region. Therefore you'll battle a handful of monsters in order to gain experience, find the Monster Node, and then you can search with impunity for all the treasures hidden in the level. These features add together to make a very enjoyable and entertaining experience. There are perhaps some slight issues with the combat system in that the stilted animations during fights are a bit jarring after the smoother overworld graphics. Also the use of flashing sprites to select targets during combat isn't as easy to see or keep track of than a simple large triangle that other games have used. Yet, these are superficial problems at most and don't detract from the combat that much. Overall, Deadly Sin provides intriguing and addictive RPG action that is accessible to new gamers as well as give experienced RPG fans a bit of nostalgia. 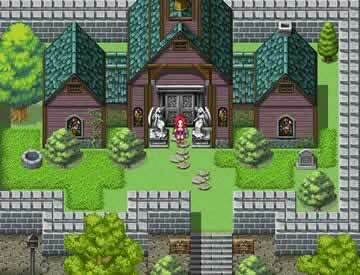 The few twists it adds to the gameplay elements are refreshing and help to give you hours of entertaining role-playing action.